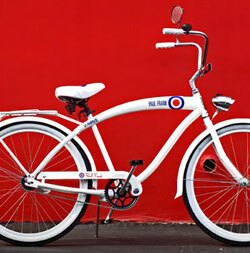 Paul Frank has a new range of bikes out in time for summer – including this Paul Frank Mod Cruiser bike. Inspired by a vintage one-speed city bikes, these new models have that vintage feel but with a modern-day construction and three-speed Shimano gears. There’s also ergonoic handlebars, a chrome rear view mirror, headlight and rack. And of course, that mod-themed design – which effectively means targets galore! Just announced, with no news of suppliers or indeed a price as yet. If we hear more, we’ll let you know. Or if you see them for sale, drop us a line in the comments box below.